The global auto industry has seen tumultuous change over the past five years with the impetus on fuel economy, safety, emissions and innovation – given everything that has been set in motion, Torque News suggests what the top five trends over the next five years may well be. In development behind the scenes over the past few years, a micro-hybrid provides a lower cost alternative to the mild or full hybrid drivetrain. Using a 48-volt Lithium Ion battery system and a generator, the additional electric system takes over the operation of accessory systems, eliminating that drain on fuel economy. Coupled with stop/start technology and regenerative braking, the system creates a much more cost efficient boost to fuel economy than the added expense involved with a mild or full hybrid vehicle, with a resulting boost in mileage of 15 to 20 percent. The micro-hybrid, based on products developed by Johnson Controls and others, should see major market implementation over the next five years, initially in Europe with other markets soon to follow. Further improvements in the efficiency level of internal combustion engines will continue to be revealed. “The efficiency of the internal combustion engine has only achieved 50 percent of its potential,” stated Tim Jackson, president of the Colorado Auto Dealers Association, in his 2013 presentation to Rotary Clubs titled “Cars at the Crossroads. The last five years have seen the adoption of direct injection and turbocharging to increase the output of gasoline engines while also increasing their efficiency. The next five years should see further developments in both cleaner emissions and stingier consumption of petrol. Advances in the production of Hydrogen and CNG may well empower increased adoption of alternative fuels and the vehicles that use them. As solar and photovoltaic cells continue to improve, this may also lead to further adoption of plug-in vehicles. Though they have yet to have much impact on the global automobile market currently dominated by Toyota Motor Corporation, General Motors Corporation, Ford Motor Company and Volkswagen AG, other hopefuls are waiting in the wings. However, within the next five years automakers in China and India are likely to begin taking a bigger piece of the African and Asian Pacific market. Though the total market should tend to grow globally, the potential profit is so high, new players will enter the fray sooner or later. China and India have long-standing auto industries just beginning to expand beyond their borders. Who can say how long it will be before Russia and Brazil decide to try their luck in the global automotive trade? Tesla recently announced a major expansion of the planned fast-charging network and will begin to expand into other markets as the next half-decade unfolds. Trends usually begin on the coasts and move inward in America and the move to electric cars may take longer to impact the central states than it did for bellbottom jeans to become the fad at the end of the 60s, but it is an eventuality. Retailers like Starbucks, McDonalds and Whole Foods will continue to add charging stations as demand grows, complimenting Tesla's efforts. Solar-Tree charging stations like the one’s at GM parking lots are likely to begin turning up in retail center lots as well. Though sales of hybrids, plug-in hybrids and electric vehicles are continuing to limp along, the recent growth of interest has them now taking close to 4 percent of the market. The faith automakers are placing in the growing interest in such vehicles shows in the growing number of models becoming available in hybrid, plug-in and pure electric power. 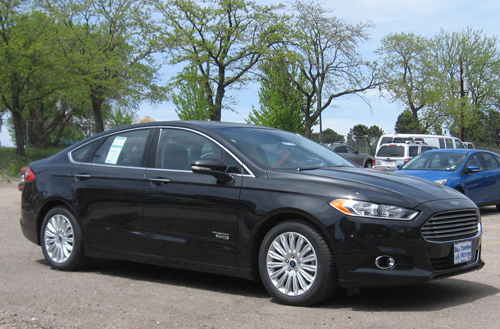 The 2013 Ford Fusion Energi, pictured above, is just one example of the growing array of plug-in hybrids now on the market. More and more choices are coming out to compete for customers who do not exist? Automakers have made mistakes before – the Edsel comes quickly to mind – but do you really think this is one of them? The market share of such alternative vehicles is bound to continue its slow growth unless world events conspire to accelerate the process – or other breakthroughs change the overall market place. Eventually it will reach critical mass and become a significant part of the market. The real mystery is whether the coming autonomous cars of the somewhat more distant future will be electric, hydrogen or multi-fuel vehicles?